Translated from the French by Francis Frenaye, this is a novel about the face of the Jewish people and the challenge to the face of one Jew--a Hungarian called Gregor. It starts out in Hungary at the onset of World War II. Gregor's parents, eventually slaughtered by the Nazis, have left their seventeen year old son in a cave. There he waits for the war to end and also for the Messiah to come finally and stop the holocaust. He encounters Gavriel in the ave, an ecstatic Jew who gives his life to save the boy's. Gavriel claims he has spoken to Elijah and that Elijah has told him: "The Messiah is not coming. He's not coming because he has already come...the Messiah is everywhere." It is long after the war when Gregor realizes the substance of Gavriel's truth. But he must first witness the horror "that's the purpose of war. It intensifies and underlines everything strange." He becomes involved with it as a resistance worker, masquerades as a deaf mute in acting the role of Judas, and searches in Europe and then in America for Gavriel: "To save the only Jew who has information about the fate of our brothers is an obligation." Gavriel however, is just a surrogate Messiah and to need him, Gregor learns, is in effect to relinquish the faith that he is everywhere: in the defiant laugh of Gavriel, in the song of the Hasidim, and in Auschwitz too. 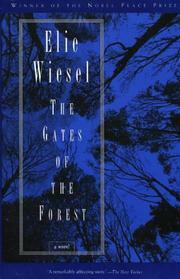 It has all been said before but Mr. Wiesel puts it down as well as anyone.